I will admit this gun was a bit of an impulse purchase. Long had I been searching for the Browning Buckmark Contour yet after almost 8 months of searching I was unable to locate one. My primary purpose in wanting a .22 LR pistol was to fulfill the role of a range/practice pistol allowing me to shoot at a markedly reduced cost compared to my centerfires. Thus one day at my local gunshop I saw the Mosquito on sale and purchased it hoping it would take that role. I had not researched the firearm prior to my purchase, something I never do, yet the price was right and I was eager for a .22 LR. I cannot tell you how deeply I regret not researching this firearm before buying. I learned my lesson and hope this review will be of use to those of you looking to add the Sig Mosquito to your collection. First to the ergonomics, this gun just feel right in my hands. The comfortable grip allows me to naturally and quickly align my sights. The sights themselves are not adjustable. Onto the trigger, my first major criticism. The trigger pull is very long and just feels squishy. It doesn't have a clean break at all, in part I believe the squishiness is caused by the trigger being made of plastic. The second criticism is the operation of the gun itself. It is notorious for FTF (failure to feed) and FTE (failure to eject). Now to be fair almost all semiautomatic .22's deal with this problem to some degree. It is to be expected, however the SIG can be a real nightmare and its failure rate exceeds all other .22's I have handled. If you already own a Mosquito or are set on purchasing one there are some remedies which will greatly improve performance. First, ALWAYS clean and lubricate the gun after each use. This seems commonsense to me but with the neglect I see others subject their firearms to, perhaps it bears repeating. Secondly, the SIG loves CCI Minimags, hollow points or full metal jacket doesn't seem to make a difference. I have tried a variety of other brands and types and the Minimag is your best option by far. Third, before you shoot your Minimags lightly spray them with a lubricant. My personal preference is Liquid Wrench's Silicone Spray. Following those three guidelines I have been able to shoot 100 rounds on multiple occasions without a single FTF or FTE. My verdict: don't purchase the Sig Mosquito. Given Sig's reputation I was really quite disappointed with this firearm. They dropped the ball big time. My greatest criticism is the trigger, sure you can kinda get used to it, but the trigger is one of, if not the most crucial element in accurate and precise handgun shooting. The FTF and FTE's are my second criticism. As I noted above, you can remedy this and greatly minimize incidents. However, I don't like being so strictly tied to one particular brand and make of cartridge. Given the current ammunition shortage across the country I have only been able to find CCI Minimag's on three occasions this year. Granted all .22 ammo is experiencing a shortage across the board right now but I am even more limited being limit to one kind. I purchased the gun to be a cheap practice gun, but have been able to utilize it far less than I had wished, hate the trigger, and am always anxious that the gun will act up, ruining my day at the range. 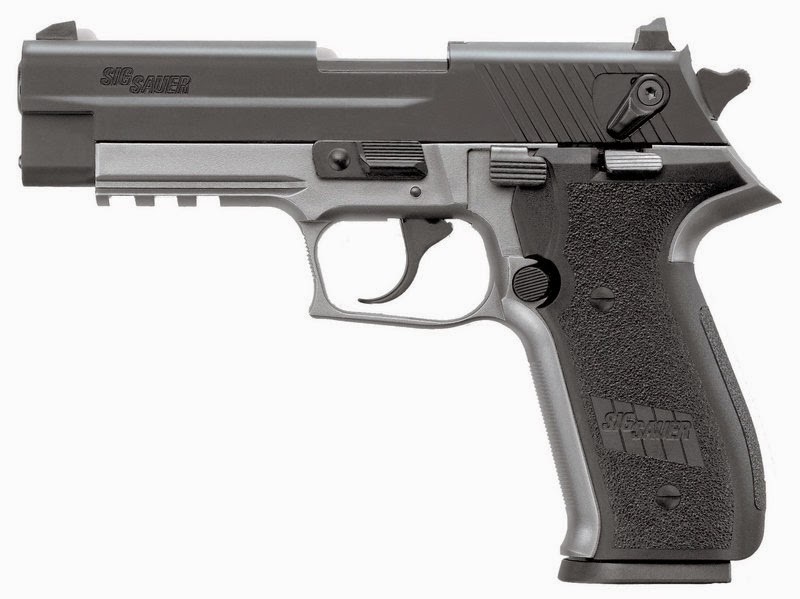 The one and only way I would consider the Mosquito is if you already own the P226 and are looking for a training gun with identical ergonomics and controls. Just know what you are getting yourself into before you purchase. For me, I assure you this is one gun that has a very limited time left in my collection. Right: my personal Sig Mosquito in the two tone coloration. Perfect. I've got some mosquito's big enough to shoot, but when you use a .357 there isn't enough left to see if you actually hit them. Just kidding, beautiful pistol. Haha, yeah I can imagine a .357 would do a number on them. I actually will be doing a review on my .357 Magnum in the future. Thanks for the comment. I have a sig mosquito and after reading the owners manual first, then cleaning the pistol per the manual and using only high quality, high velocity ammo (the owners manual does not recommend any particular brand of ammo btw) I haven't had a lick of trouble out of mine. I would recommend this pistol to anyone looking for a good plinking .22. James, perhaps yours is an anomaly as most owners I have talked to have had the same issues. That being said I respect your opinion and am glad you enjoy your firearm. Thank you for your comment and wish you all the best. I welcome all opinions on this blog. Outside Found | A blog about adventure and exploration in the U.S.A.